Minot’s Ledge lighthouse protects a dangerous rock formation. Minot’s Ledge, located south of Boston Harbor in Cohasset, Massachusetts, was a destructive rocky ledge that destroyed many a vessel and claimed many lives before Minot’s Ledge Lighthouse was built there in January of 1850. It took three years to build as an engineering feat consisting of an enormous lantern perched on a huge 87-foot skeletal iron tower to protect the structure and its keepers against the strong winds and waves. 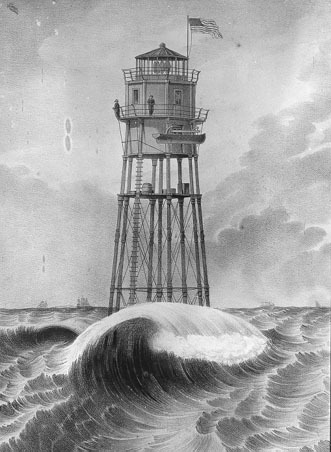 The concept was that fierce winds and waves could pass through as opposed to constantly smashing a solid enclosed structure, as was the construction of most other lighthouse towers. Almost as soon as the tower was built problems seemed to arise, with complaints from its keepers. Constant vibrations from the pounding seas and winds caused observable cracks in the locations where holes were drilled for the pillars. The pillars were becoming loosened and on the January before the storm hit, Keeper John Bennett stated that he felt the lighthouse would not last through the winter, as he or his assistants would be thrown off their feet when heavy seas would pound on the structure. His superiors told him that it was believed safe and he was to stay and continue his duties at the lighthouse. Minot’s Ledge lighthouse original skeletal construction. Image courtesy US Coast Guard. 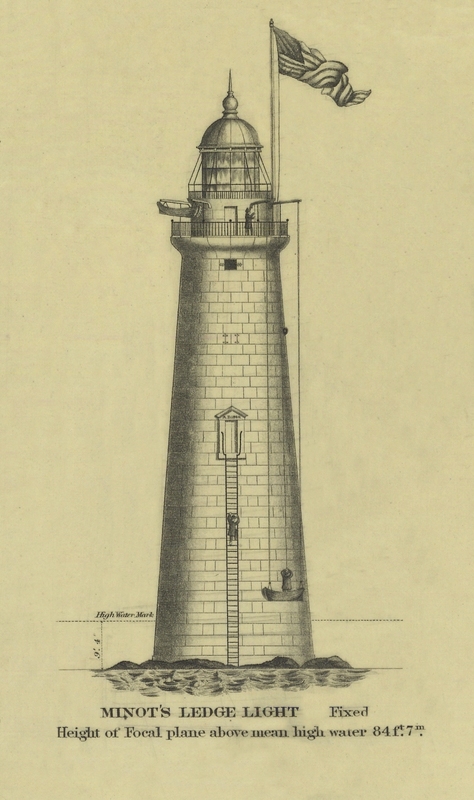 Just before the storm hit on Monday, April 14, 1851, Keeper Bennett was ordered to come ashore to gather much needed supplies and had left his two young assistants, Joseph Antoine, and Joseph Wilson, to manage and tend the lighthouse in his absence. Joseph Wilson was a proud sailor, and was reported in March, prior to the storm, in response to inquiries from reporters in regards to the safety of the lighthouse, that he would stay as long as Bennett would stay, and that only when they would leave the lighthouse, it would be too dangerous for any one else to take over. Joseph Antoine was a Portuguese sailor with relatives in Cohasset, and loved working at the lighthouse. The storm had come upon the Massachusetts coast suddenly that Monday afternoon with a vengeance, preventing the two men from leaving their post. By Wednesday afternoon, April 16, the seas were still surging and pounding Minot’s Ledge light. The only way to reach the shore would have been to descend the 87-foot structure down a rope outside to their small boat and battle the devastating waves for miles to reach the mainland. An impossible task as the two had no choice but to ride out the storm and hopefully survive. At five o’clock, as the seas worsened, the men lit the lantern so that others may avoid a perilous fate. By nightfall, the seas continued to swell from the high tides, ferocious wind gusts, and torrential rains. The brave men continued to perform their faithful duties uncertain as to whether they would survive the night. Anxious locals observed the lantern from the shore while hurricane force winds gusts recorded at over 100 miles per hour continued to thrash at the lighthouse. The two assistant keepers managed to keep the lighthouse lamp burning as late as 10:00 PM as observers watched from shore. The fog bell continued to ring until around one o’clock that morning when it was swept away with the tower. It could only be imagined the anguish the two men were feeling as they awaited their fate. The emotions they had as the tower started to give way under the pressure of the devastating waves and hurricane force winds. Their cries would never be heard in their last minutes as the pillars gave way, sending the entire iron structure toppling under the waves, tossing them to their watery graves. Around 4 o’clock on Thursday the following morning, there was a lull in the storm and Keeper Bennett went to the beach to see if the tower was still standing. He found no evidence of the tower in sight, only the bent iron pilings where the lighthouse once stood. Plenty of debris had washed up on the shore. 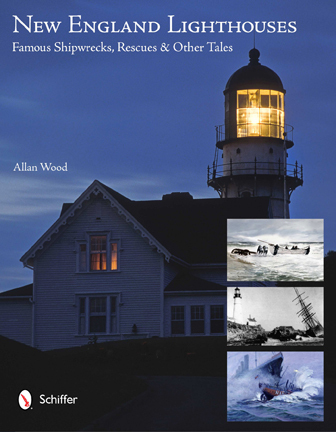 As he observed the debris, he found much had belonged to the lighthouse structure and keeper’s living quarters, including bedding and some of his own clothing. He found two life vests washed ashore which appeared as though they had been used, but may have been washed off their inhabitants by the angry waves. Joseph Antoine’s body was found later that day near Nantasket Beach and Joseph Wilson’s body was found washed on nearby Gull Island. The men have always been regarded as true heroes of Minot’s Ledge Light. Minot’s Ledge light 1860 construction after storm. Image courtesy US Coast Guard. By Sunday, April 20, the storm had finally cleared away from its near week long of devastation in New England. It would take many years afterwards to access and rebuild the damage caused by this fierce and destructive storm. It was later given the nickname the “Lighthouse Storm”, as it was directly responsible for the destruction of Minot’s Ledge Lighthouse. 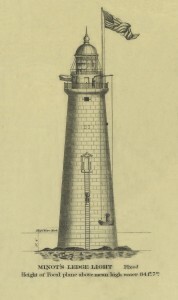 Keeper Bennett became in charge of a temporary light ship beacon anchored just off Minot’s Ledge where the original lighthouse stood, to serve as a temporary replacement until a new lighthouse could be built. The construction of the new Minot’s Ledge Lighthouse began in 1855 and was hailed as the greatest achievement in lighthouse engineering, from lessons learned of the ill fated previous structure. The construction of the new lighthouse took time as many of the constructions workers, who were only allowed on the project if they could prove they could swim, would be swept off the rocks by the constant breaking of the waves over the ledge. Two years into the construction of the lighthouse, the ship, New Empire crashed on the dangerous ledge and destroyed most of the lighthouse. Three years later, in 1860, Minot’s Ledge lighthouse was finally completed as one of the most expensive lighthouses in history. It is still considered to be one of the top engineering feats of the Lighthouse Service. Antoine and Wilson are still remembered each April, and many believe their spirits are still guarding the lighthouse. 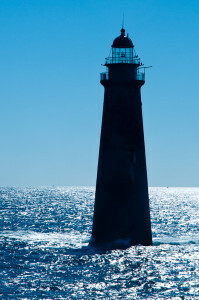 Each summer Boston Harbor Cruises offer various tours out of Boston that will take you to the lighthouse in its remote location off Cohasset. Friends of Boston Harbor Islands provide tours to the lighthouse among others in their Southern Lighthouse Tour. 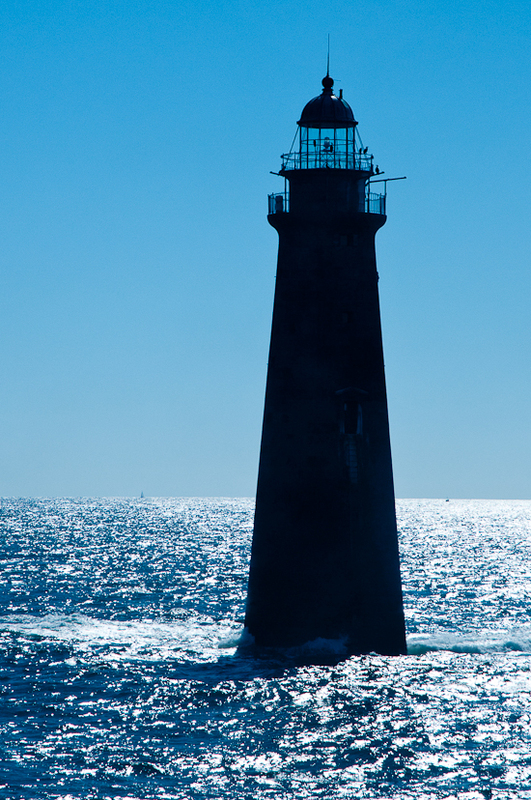 Both of these tours offer historical narrations and great perspective views of the importance of these beacons in protecting mariners from the many islands and ledges that surround Boston Harbor. Enjoy the tours this summer!